Jarrett Min Davis, “Ambush at the Pass,” 2011, oil on canvas. On the tenth anniversary of 9/11, ten years of war in Afghanistan and Iraq had produced over 6,200 US military fatalities and more than 45,000 wounded American soldiers, along with tens of thousands of additional casualties among coalition troops, enemy combatants, and unfortunate civilians. 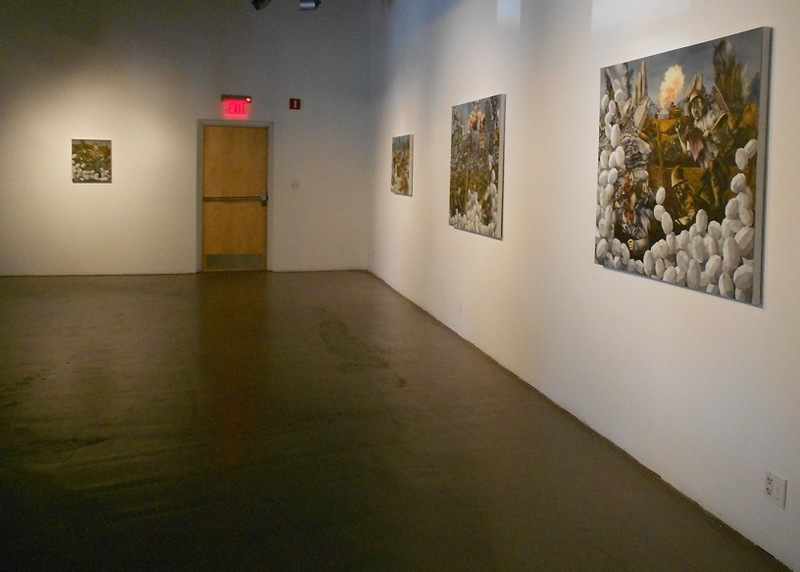 Jarrett Min Davis‘s new work explores how we live with war. Here’s the catalogue essay I wrote for “Guts and Glory,” his recent solo exhibition at Real Art Ways, one of the best alternative art spaces in Connecticut. Covering Jarrett Min Davis’s new canvases are mangled tanks, destroyed buildings, and heaps of dead soldiers with torn-off limbs and eyes popping out of their sockets. In this age of counterinsurgency and embedded photojournalists, the images of war make obvious topical sense. But there is also something subtler in Davis’s meticulously constructed paintings. Dainty white geometric forms mysteriously pool at the bottom edge of each painting and seem to float delicately into the air. These serenely uniform shapes are pointedly out of place in the violent, disorderly scenarios that the paintings showcase, and dramatically signal that Davis is not merely rendering illustrations of military battle. What are they, and what does he intend? Several years ago, Davis was in South Korea, his birthplace, where the memory of brutal war remains palpable after nearly 60 years, during the three-day Lotus Lantern Festival held every spring in anticipation of the Buddha’s birthday. Hung and lit over those three days, the lanterns symbolize a devotion to good deeds and the Buddha’s illumination of the dark parts of the world that are filled with agony and despair. Yet the image that stuck with Davis was that of the festival’s aftermath, when celebrants have cut down the paper lanterns and left them lining the streets. Employed to punctuate scenes of carnage and mortal loss, Davis’s discarded lanterns suggest the continued potency of peaceful impulses against hostile ones. 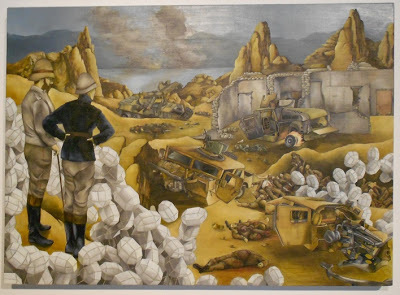 In their fixation on bloody mutilation, Davis’s paintings recall the 1924 “Der Krieg Cycle” that Otto Dix made after serving on both main fronts in World War I. Dix’s monumental etching portfolio, completed in an edition of 70, is an unflinching testament to the horrors he saw in battle. Made from his memory rather than from images sketched on the battlefield, most feature tightly cropped groups of soldiers, both dead and alive, against simplified backgrounds. Davis, however, has never served in the military, and therefore had to research his subjects thoroughly to inform his imagination. 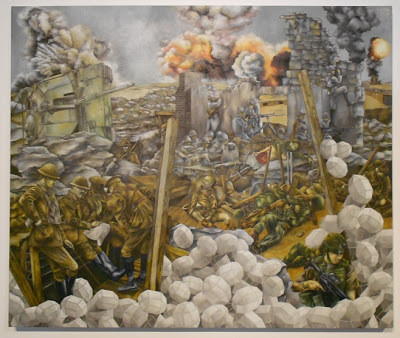 Furthermore, unlike Dix – who focused obsessively on one situation at a time, always drawn from World War I – Davis merges several combat episodes from different epochs into a single painting. Visually, the simple lantern-like forms function as framing devices that help Davis to organize a correspondingly intricate canvas. In “Ambush at the Pass” for instance, standing on a little hill situated in the lower left quadrant of the painting, two officers wearing pith helmets, belted jackets and khaki jodhpurs appear to conduct an after-action battle assessment. 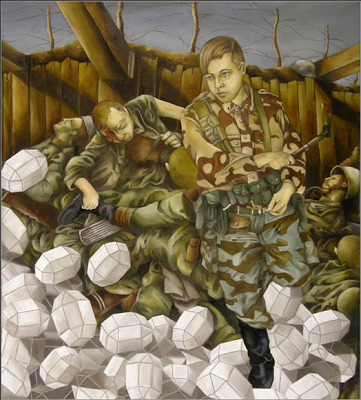 Surrounded by the enigmatic white geometric forms, they gaze out over the battlefield at overturned armored vehicles, dead soldiers, and the rubble of a bombed-out building. Further in the distance, rocky outcroppings rise from the battlefield and smoke ascends into the cloudless sky against a backdrop of mountains on the far bank of a narrow river. Among the artful incongruities here: the officers surveying the wreckage in the foreground are of the late European colonial era, while the dead soldiers in the field are wearing the olive-drab uniforms of World War II vintage. The overturned and burning armored vehicles, all with gun turrets, incorporate aspects of contemporary Humvees, Bradleys and Strykers in use in Afghanistan and Iraq. Jarrett Min Davis, “Forward Post,” 2011, oil on canvas. Similarly, in the left-hand corner of “Forward Post,” closest to the viewer, a clutch of officers in brown uniforms and high black boots huddle together smoking in a short trench while looking at a map and planning an operation. Above their heads, closer to the horizon, a tank lies overturned with smoke billowing from its rear. Next to the tank, a lone figure wearing a gas mask stands in a trench staring out at the viewer. The trenches and the mask reference World War I, while the tank – only introduced in that conflict – alludes more firmly to the next global conflict. In the middle of the painting, grey-outfitted troops seem to be storming an enemy position, while just below them, dead soldiers in green uniforms lie mutilated in a heap. Behind them artillery explodes. On the far right, up near the horizon, projectiles explode into fireballs. The pristine white lanterns are heaped in the foreground, bracketing the savage vignettes. These mash-ups are anything but careless or random. Rather, in juxtaposing particular elements of different wars with the fallen lanterns’ symbolic lament and inspiration, the paintings radiate a transcendently inter-generational – indeed, universal – sympathy for soldiers and aspiration of peace. In all of his paintings, Davis’s paint handling remains constant. He doesn’t use seductive sfumato to generate sentimentality or agitated facture to give the viewer a kinetic sense of action unfolding. Instead, his meticulous rendering purposefully flattens the three-dimensional illusion of the images, presenting an amped-up hyperrealism that recalls early American folk art. Thus, he is not sharing an experience of war, but rather constructing both a narrative of what he thinks war must be like for the individual and a synthesis of its cumulative human impact. Jarrett Min Davis, “In the Trench,” 2011, oil on canvas. Davis’s point of view is omniscient but removed, a bit like that of a precocious child playing with toy soldiers. But his attitude is neither viciously gung-ho nor smugly pacifist. Davis’s sympathies lie beneath (or above) politics or philosophy, with the individual soldiers. Understanding their unspeakable predicament, he forgives their lethal behavior. “In the Trench” depicts a soldier wearing tan camouflage – a nod to the Gulf War and those that have followed – and carrying a bloody hatchet who appears to be moving through a trench full of dead enemy combatants. Resonating Vietnam (and perhaps Rwanda), one has been stabbed from behind with a machete, the long blade sticking out through his chest. The question arises whether the soldier holding the hatchet has slaughtered an entire platoon. Looking all of sixteen years old, he raises his desensitized eyes beyond the frame, looking forward with the proverbial thousand-yard stare. Jarrett Min Davis, installation view. Whereas Dix was exorcising his own demons with his series of etchings, Davis is trying to understand how war haunts soldiers as it did Dix. If Dix was understandably resigned to pessimism, Davis seems an as yet unbowed realist asking hard questions. One especially pressing one is whether soldiers can manage to get on with their lives after the horrible experience of war. With technical virtuosity, assiduous method, an intense but calm focus, an inventively eclectic embrace of history, and the intellectual discipline to withhold judgment about the politics of particular armed conflicts, Jarrett Min Davis vividly and intelligently offers hope that the answer is yes. Great review Sharon! Powerful work.